Designed and built by ESawdust in Colorado, Chameleon 1 is an enclosure for popular development boards including Arduino and many Olimex dev boards like the AVR-P28. It also supports the XBee Regulated and FreeWave MegaMini RF modules. What makes the Chameleon so great is its universality, and its ruggedness. At only 9oz, it's surprisingly light but can withstand being thrown across a parking lot. 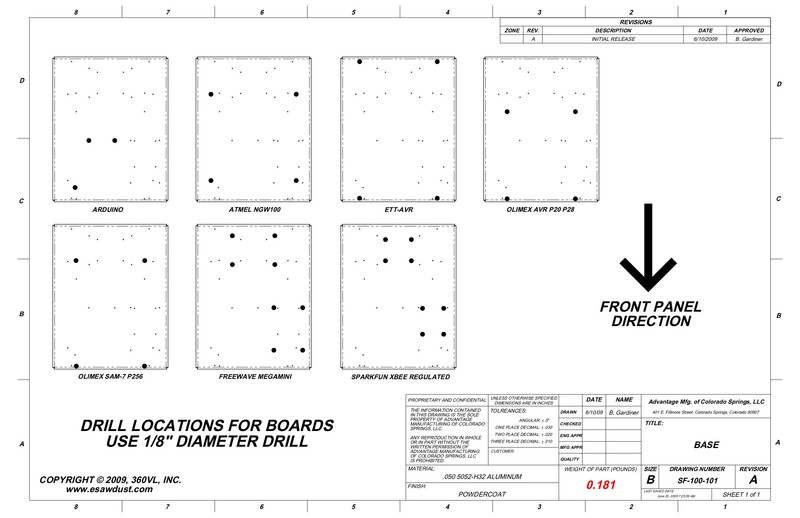 Using a 1/8" drill-bit, as referenced by the hole guide, holes are drilled so that the 1/4" standoffs can be mounted on the universal base plate. The pre-centerpunched holes (small dents that guide the drill so it doesn't skate) make drilling much easier. No measuring or tweaking is required. 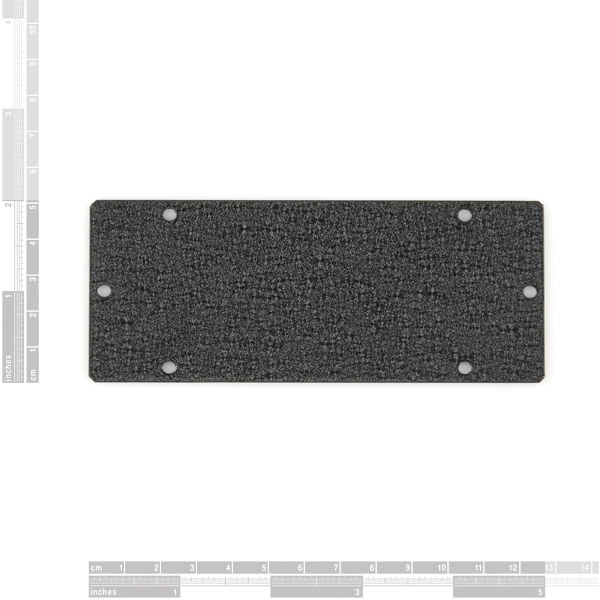 The hole pattern for the Olimex AVR-P28 is 80x100mm and is a very common board size. The Chameleon 1 base plate was engineered to accommodate a host of 80x100mm boards including most Olimex dev boards and the SparkFun Marsupial protoboards. Chameleon 1 is made of a stiff, lightweight aluminum. 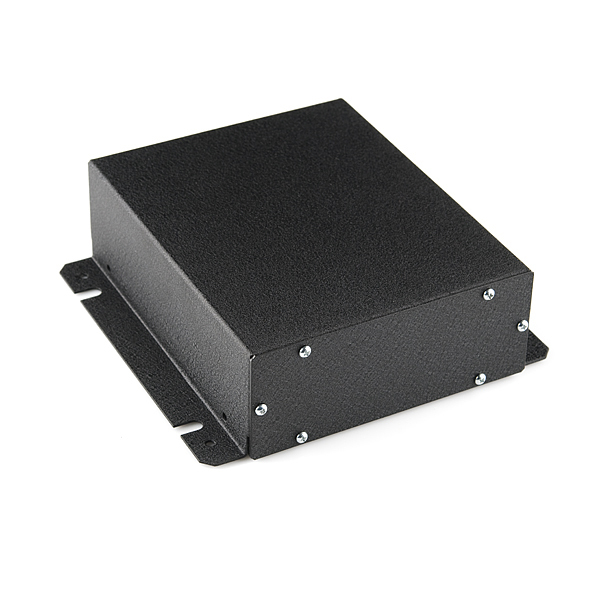 At only 9.5 ounces (269 grams), Chameleon 1 is a ready-made, rapid-install, hard-shell enclosure for your system. Once assembled, the enclosure feels rock solid. Chameleon 1 comes standard with a powder-coated black exterior that can be used as-is or painted if desired. Note: The Chameleon comes with a single faceplate, but you will need another one to fully enclose the box. You can either get a blank faceplate or a specialized plate. Lid: 2 x 5 x 6.15"
Base Plate: 0.40 x 4.90 x 6.15"
It isn't obvious from the description (not to me anyway) that you MUST order an additional face plate. Since it said it came with a blank face plate and none of the specialized ones fit my needs, I didn't order one. I didn't realize that BOTH ends of the enclosure are open and only one faceplate is included. It doesn't seem to matter what I buy, I always have to make a second order to get everything I need. Which, of course, means double shipping. Not like buying locally matters, though...I usually have to make two or more trips to the hardware store too! I made the same rush purchase as ActionPhoto, and was disappointed to discover that while the product ships with one face plate, the box has two faces! I've been working on a few new items for the Chameleon 1. First some DB9 faceplate designs and secondly, we're in the process of design and manufacture of the no-flange lid suggested above. Here's an article on the faceplates that are in the works, particularly DB9 variations. I'm interested in feedback on the designs and any requests for new types of faceplates you need. I just uploaded a bunch of new faceplate designs for this enclosure system including a blank template, perforated/ventilated, and a range of DB9 designs. You can use these as-is or starting points for new faceplate designs. I have laser cut faceplates on 1/8" acrylic which seems to work well. How about having the dimensions in metric as well - for the rest of the world! If you are planning on placing an Arduino (UNO or MEGA) on the right height relative to the cut-outs for the DC connection and USB, you will need -10mm stand-offs- ï¿½instead of the 6.5mm (metal?) stand-offs supplied. Actually, not a big draw-back, as the stand-offs ought to be plastic/nylon anyway for isolation purposes! Last, from a material point of view, the rather 'stiff' price would be more justified, in my personal view, if the material for the box had been duraluminium a.k.a dural, -which is slightly heavier but a tougher alumininium, enhancing the box on the screw-holes issues mentioned above, as the windings cut would last longer. This could use an LCD faceplate. Any particular LCD you're looking at? We've considered LCDs before, but there are a plethora of them. This is currently listed as $19.95 over at ESawdust... Any chance Sparkfun will match that? All in all, this is a nicely built enclosure. With all the self-tapping screws in it is nice and tight, very sturdy feeling. Once I figured out what holes to use it fits perfectly with an Arduino Duemilanove and holds it very securely. I've found that the metal the case is made out of isn't very hard. I've noticed that the self-tapping screws feel decreasingly secure the more times you take them in and out. Also, the hardware that ships with it is really soft. I've trashed a couple standoffs and screws with my Radio-Shack screwdrivers (the ones in the blue/clear case) and a pair of needle-nose. I bought this because I thought it would be very modular, something I could use for one project and then recycle for a new project when it came up. I've probably changed it's purpose once a month for the last 3-4 months. I am a bit disappointed in its performance as such. It's nicely built but it doesn't seem well suited for being repurposed frequently. I would be nice if new tops were available to purchase without having to buy the whole thing as well. I also like the idea of a top without the flanges, they get in the way quite often. 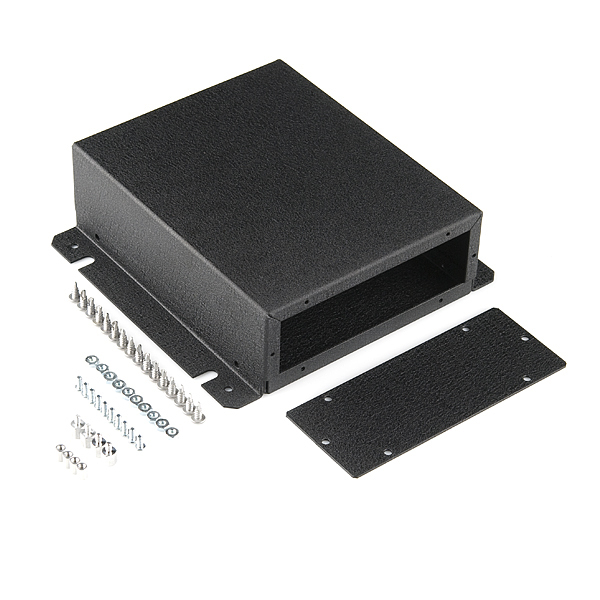 Replacement case parts and components are now available http://bit.ly/caseparts if you're interested - lids, baseplates, hardware are now available ala carte. I'll be working with Sparkfun to offer them here as well. feel free to contact me at: https://www.esawdust.com/feedback/ and I'll send you some new standoffs. I haven't discussed this with Sparkfun, but I'm more than willing to offer components separately so you can replace a specific piece that wears out without having to replace the entire thing. Again, contact me if you need spare parts for these and we'll see whether sparkfun would like to offer spare parts as well. 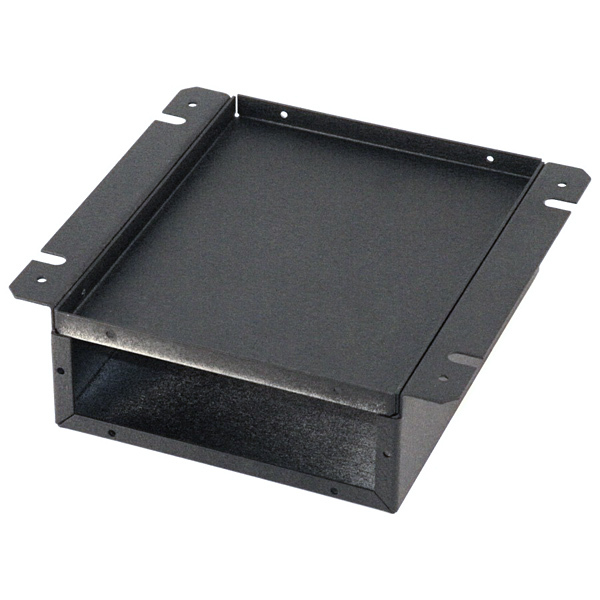 I'm considering the non-flanged lid and other variations as well such as adding a DIN rail adapter. I guess that is what $30 gets you these days. Good to know. The "Drawings and Applications Guide" says this comes with 1 blank and 1 of each of the custom faceplates, but the description on the page here says you get just the 1 blank. Also, a lid without the flanges or feet instead of flanges would be a nice option. Sorry! We'll work on getting the document corrected. This product ships with only one blank plate. I'll talk to Landon about a non-flange option as well. The price is just ridiculous. $30 without a piece of electronic in it. My only problem with this unit is the openings for the holes for the screws of the serial port don't line up perfectly with a standard serial port so you have to grind the holes a bit to make them work. At least this was the case with the Arduino faceplate.